Updates to Cherame's profile since your last visit are highlighted in yellow. After graduating, I attended TCC and ODU. Enjoyed my young life all through my 20's and met Dell, my husband,in 2000. We moved to Portland, Texas for 3 years and returned to VA Beach that is when I decided to settle down and get a real job so I went back to school. I attended the Florida Institute of Ultrasound to become a Diagnostic Medical Sonographer and tied the knot in 2007. I have a fun loving stepson Rogelio that is 11. Now, I'm enjoying my summer! I think I was shy. In my Junior and Senior year in high school, I was out the door by noon since I was in the Business/Fashion Program. Senior Fashion show was one of the highlights of school. There were times I often felt like I was in my brother, Vlad's shadow. Looking back, every one was nice to me and I live with no high school regrets. Cherame Cruz Reveche has a birthday today. 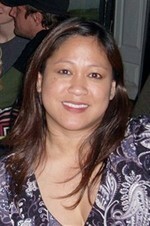 Cherame Cruz Reveche updated her profile. View.